unless it happens to be on the short list of stuff I still want to buy. Make that need to buy. I am in a constant state of sorting and giving away stuff. Currently, there's a bag stuffed full of some clothes I haven't worn for quite awhile. Hopefully, some worthy organization or another will prosper in a small way from these items plus the several more items I will manage to cull from my closet before the day comes when I put the bag with its stuffed-full sisters on the curb for the Friends of the Big Brothers and Sisters or whomever. Tax time always reminds me of the crazy way money gets spent around here (notice how the money just "gets spent," like there's not a profligate lipstick-buying out-of-control consumer buying cosmetics and clothes and Meyer lemons). In my mind, I'm sorting through all the available ways to save more, spend less. But that makes me feel panicky. The kind of panic that makes a girl go out and buy stuff. I love these shoes! I only regret that I wasn't somehow involved in your purchase of them--in my capcity as consultant in all things, of course. Sounds like we need to do some end of the semester shopping!! 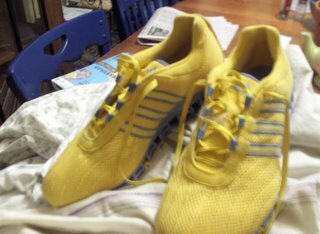 I have cool white Italian running shows with yellow and black trim. I don't wear them that much because they are so cool and because I haven't been running in far too long. Yellow is a cool color for shoes.